The H Factor: Are YOU One of the Watch D.O.G.S.? 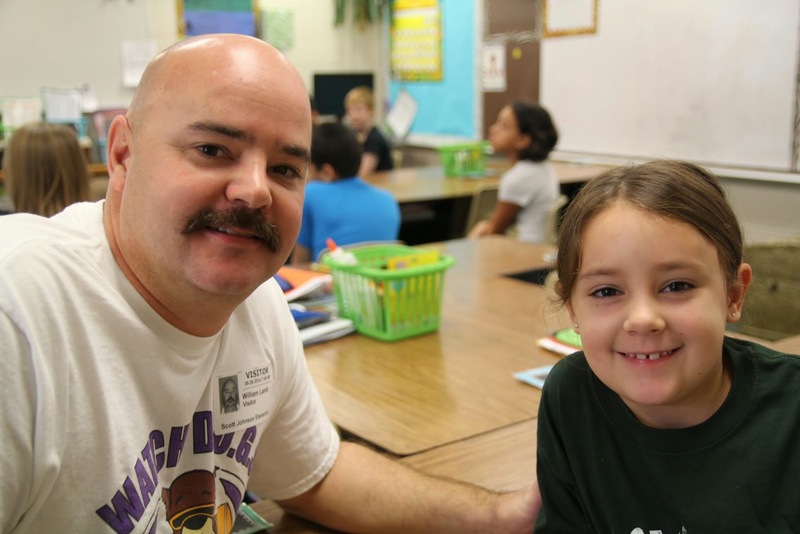 Mr. William Lamb, along with lots of other Scott Johnson Elementary dads, are definitely Watch D.O.G.S. How did that happen? and he begins today by helping with the car rider line. It all began last year when Huntsville Firefighter and District Dad William Lamb caught a story on The Today Show about the National Center for Fathering and their Watch D.O.G.S. program. It's a one-of-a-kind, school based father involvement program that works to support education and safety. Once Mr. Lamb saw the story, he knew he had to act. From Reading Aloud to Helping with Clean Up- Watch D.O.G.S do it all! So he contacted Scott Johnson Elementary, and working closely with School Counselor Mrs. Marsha Stringer, they launched the program at the beginning of the school year. who's dad, Anthony "Moose" Williams, is definitely one of the Watch D.O.G.S.! It began with an orientation meeting one weeknight a few weeks back, and both Mr. Lamb and Mrs. Stringer were bowled over at the attendance. Mr. Lamb learns something new everyday from the kids at Scott Johnson Elementary! At least one hundred dads attended, and since then there has been a steady stream of volunteers. Biological Sciences at Sam Houston State University. Today was his first day as one of the Watch D.O.G.S., and if felt great! free time away as Systems Analyst at the Texas Department of Criminal Justice. Some Watch D.O.G.S. can make a weekly commitment, others monthly and still other dads can come only occasionally. posted on the Watch D.O.G.S Wall of Fame at the front of the school. Mr. Hartley comes whenever he can when he isn't working at the Kroger's here in town. The process is simple. First, we a do background check and go through an orientation. Next, Mrs. Stringer creates a personalized schedule based on the school's daily needs and reflecting the opportunity for the Dad to spend time in their child's class (and to eat lunch with their kid, if the volunteer's schedule allows). Is that a proud dad or what? Mr. Arcibar poses with his son Emilio (left) and daughter Ali. We all know that you don't have to be a Dad to be a positive adult male role model for your (or any) child, so the Watch D.O.G.S. program is available to grandfathers, uncles and any significant male figure in a child's life. The Watch D.O.G.S Wall of Fame is filling up, but there is always room for more!! What about the kids? The children of Watch D.O.G.S. love it! Ask any of them and they'll tell you about how much fun it is for them to have their Dads at school with them. Craftsman with the HISD Maintenance & Operations Department and one of the Watch D.O.G.S.! Let it Begin! The line is long, but it goes fast! Mr. Lamb invites any dad with available time to come on down, make a difference and have some fun! Not only can you get some insight into your kids' lives, you feel pretty dang great doing it! "A Man's Gotta Eat!" Why not dine with your daughter? Help is now available in the cafeteria for opening rascally milk cartons and ranch dressing packets. If you want to join in, please contact Marsha Stringer at Scott Johnson Elementary. There is always room for one more! Watch D.O.G.S find a need and fill it. Here, the student council could use some help raising the flags.